For information, please contact us at 519-579-3800 or sdcwr@waterlooregion.org. We believe that informed and engaged citizens who have a chance to meet the candidates face to face turn out in greater numbers to the polling stations. We also hope that knowing the elected officials in person helps people to stay in touch and to work with them in-between elections. This is not a debate! 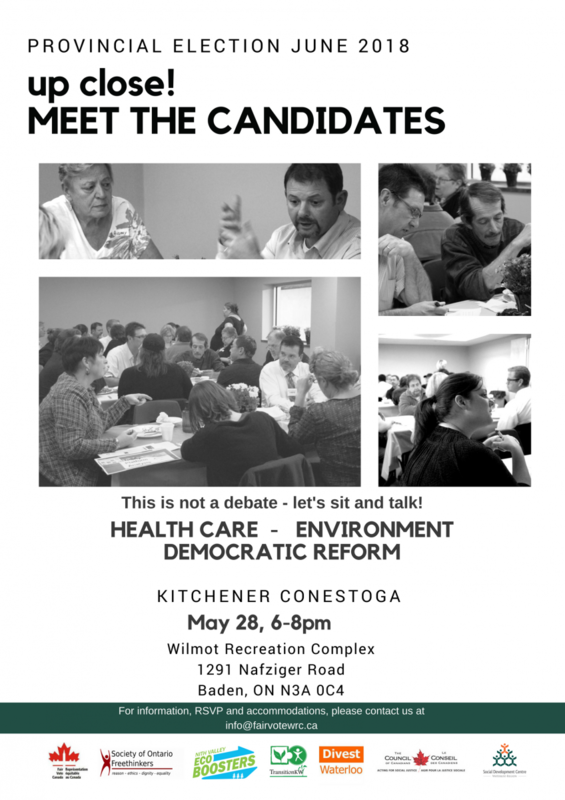 The purpose of this Meet the Candidates Forum is to provide a common ground for people with different perspectives to discuss some of the issues and policy directions that are important for the wellbeing of everyone in our community. The first part of the evening is roundtable discussions! 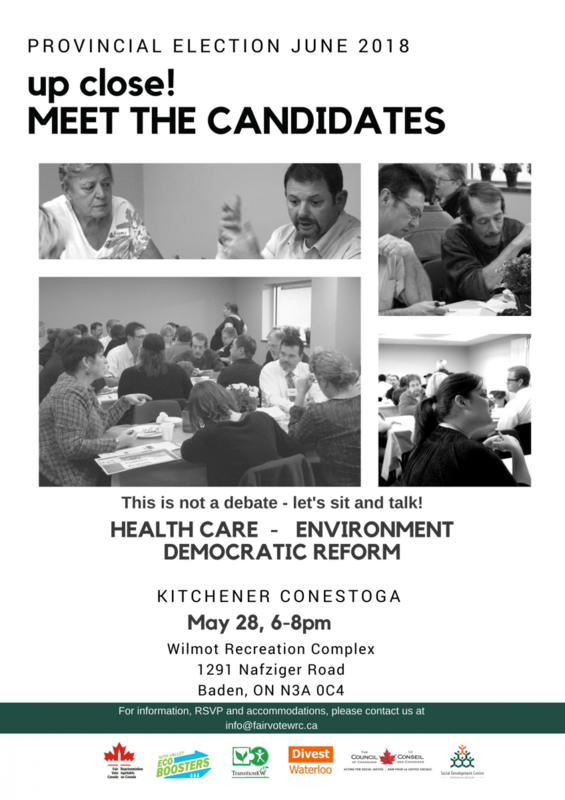 The topics for discussion are identified through the grassroots work done by the Social Development Centre Waterloo Region and the partner organizations working in the areas of affordable housing, accessible health care, income security, environmental justice and democratic reform. The candidates can ask the questions and voters can give answers! Through facilitated discussion, both the participants and the candidates will have the opportunity to talk in an informal atmosphere. The candidates are encouraged to ask questions to understand the experiences and concerns of their constituents more deeply. The organizers of this event are not promoting any party over another. We want all candidates and political parties to respond to the concerns that impact the wellbeing of our community and provide equal participation opportunities for everyone in social, economic and public life. 1. Keep the discussion focused on the topic at hand. You can change the group and the topic at any time. 2. Respect one another’s experience and perspective. We are here to listen and learn, not to debate or attack any one, any group or any party. · Candidates are encouraged to move to different tables throughout the evening. · Candidates are encouraged to bring along supporters and have them participate in the small group discussions. · Candidates will get 15 minutes during the break to prepare their presentations. · Candidates are asked to focus their presentation on the issues and specific concerns that were discussed at the tables. · Candidates will make their presentations based on the order in which they signed in at the meeting. The Moderator reserves the right to make adjustments to the order. The order will be announced before the start of the presentations. · Each Candidate will have at least 3 minutes to make their presentation. A longer period may be provided, depending on the total number of Candidates. The Moderator will decide the length of presentations before the break. The Time Keeper will signal to the speaker when there is 1 minute and 30 seconds to go. · Each presentation will be videotaped and the camera will be stopped at the end of the allotted time period. · After all candidates have made their 3 minute presentations, they will have 1 minute to provide the final statement. The moderator will determine the order. All the candidates are invited to come with other members of their teams and to bring their campaign or party platform materials. For a list of ALL CANDIDATES MEETINGS in the region, follow this link to a spreadsheet and tell us which ones we are missing.